I found this gem while browsing NetGalley for interesting books to request and I decided that this one sounded pretty interesting. I basically start out by looking in the Sci-Fi/Fantasy sections and scan for cool titles or cover art and then I’ll read further about any books that have caught my eye. This particular book had a cover that was dark and appealing and the title was intriguing to boot. I thought perhaps the title was a play on the saying ‘a murder of crows’. 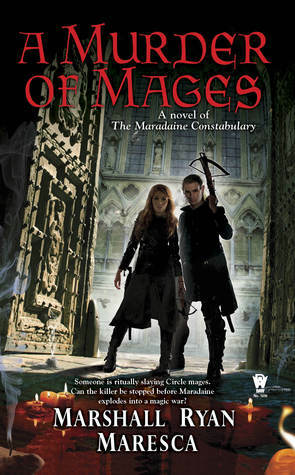 I was, however, somewhat surprised to find that it was literally about the mysterious murder of a multitude of mages. How’s that for alliteration? The story immediately drew me with a well done introduction in and by the second chapter I was hooked. Satrine Rainey, former intelligence agent and wife of a disabled Inspector, tricks her way into an Inspector’s vest in order to provide for her family and is partnered with Minox Wellings. Inspector Wellings has never been able to keep a partner for more than a week and has 25 cases that he considers “unresolved”. These two misfits make a fantastic pair their dialogue throughout the book felt very natural. The murder-mystery aspect of this book was incredibly interesting and the identity of the killer was in question up until the end of the book. I had some suspicions throughout the book, directed at several more minor characters, but the reveal was certainly shocking. There was never a dull moment and I could have read this book in one sitting if I’d had that kind of free time. Maresca has written a fine story and I’m looking forward to reading the sequel when it is published. Without hesitations, I would say that A Murder of Mages deserves 5 out of 5 stars!!! I was so pleased with the quality of the writing, the plot and the characters. I did receive this copy of the book from NetGalley and PENGUIN GROUP Berkley, NAL / Signet Romance, DAW for review purposes before the release date, which is July 7th 2015. This book is available in eBook and Paperback copies. One thing I would like to point out about the eGalley copy I received is the crazy formatting. There were many instances of random capital letters and incorrect lowercase letters throughout my copy, which will hopefully be corrected in the final version that will be for sale.